For the past few days, Starbucks has been inviting customers to try their new Via – the latte Vias with dairy. 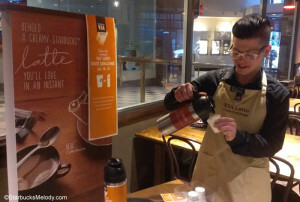 It was the The Via Latte Taste Challenge (from January 16th through the 19th) for the two new Via Ready Brews: Mocha Latte Via and Vanilla Latte Via. 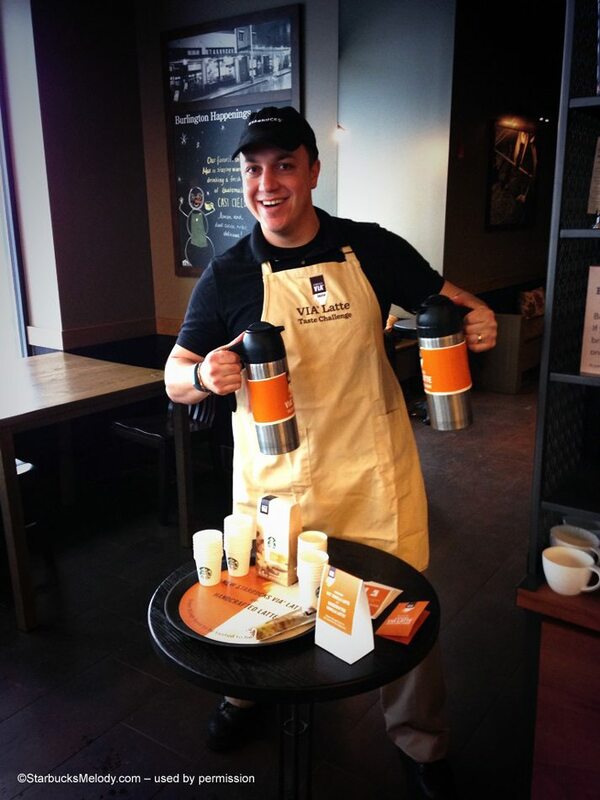 There has been sampling going on, and many customers received a coupon for $1 off a handcrafted beverage. These kind of sampling/challenge events are pretty fun! 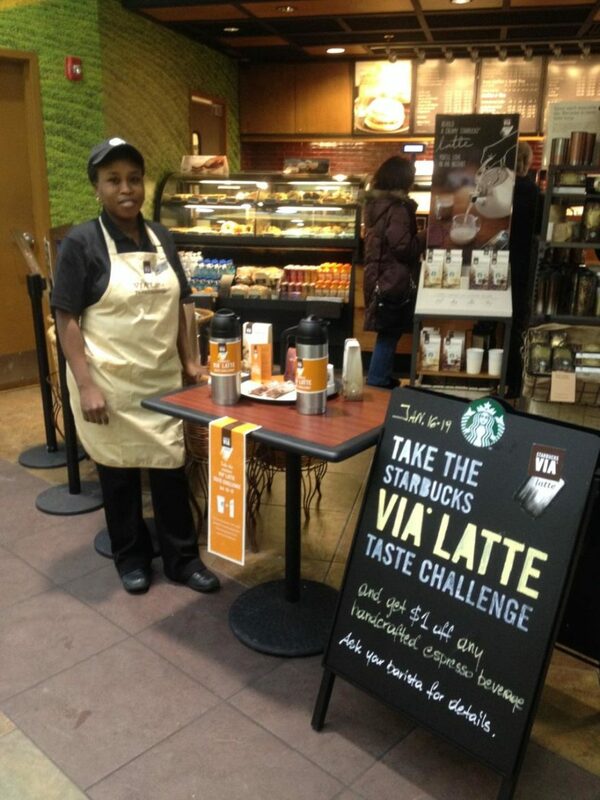 Brooke in Silverdale, Washington did the Via Challenge sampling for her store. I’ve met her in real life, and I’m quite a fan of Brooke! 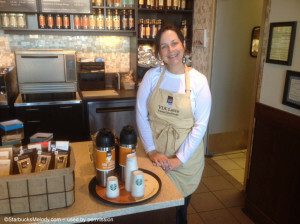 Sometimes I have to take special trips out to Silverdale just to visit a couple of the partners at this store! I got this pic from Morgan in Virginia, and I love what she wrote to me: “I’ve been with the company for 5 years and it gets better every year.” That says it all! 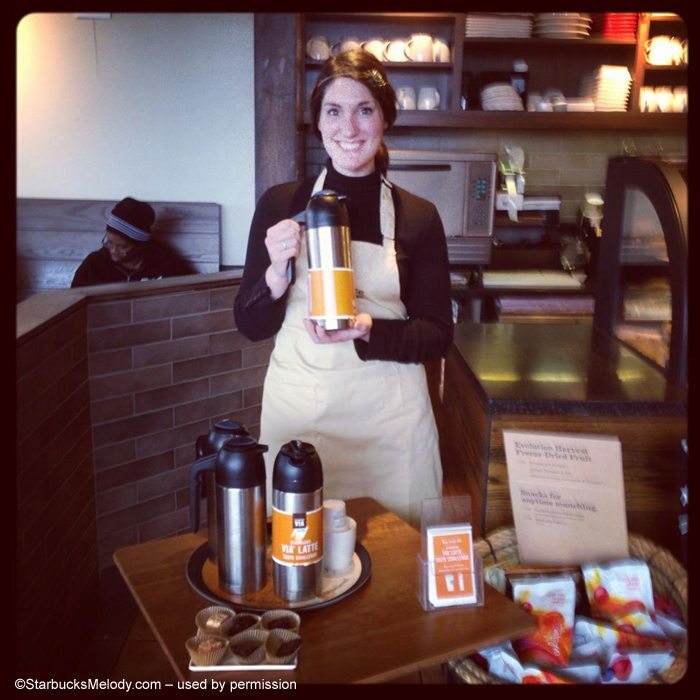 Now available: Starbucks Via Ready Brew in a jar! I love how happy they all look. I did walk in on a taste test at my local store. 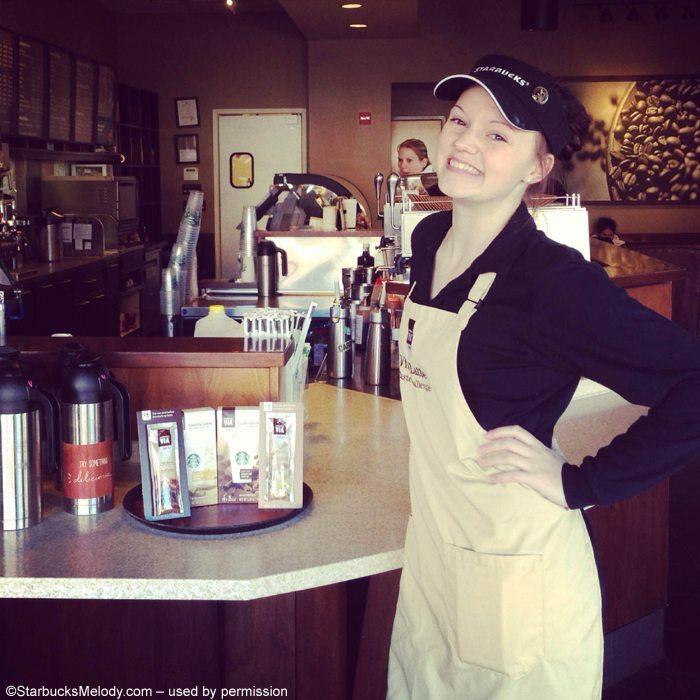 It was so crowded being a Saturday morning but the barista was smiling and doing her best. I think she should have been set up away from the wrap around line and with balloons to get people’s attention like in the picture of Nicole in Florida. But at least they were making the effort. I tasted the mocha and got the $1 off coupon to use for my drink. I missed them too . I will buy a box some day soon though . It’s not for me on a regular basis (die-hard black Americano drinker), but I did think the mocha was tasty, if you want some calories. I never was in one store (middle of the day-early afternoon) during those days when this was being done. I did see some signage about it, some remaining evidence that something like it had been done, but never was in any store when it was done. (I did receive a couple packages of each, before the did this) Only have tried the mocha, with milk, which was ok but not nearly a mocha like made in the store. I would just make my own creation at home, and don’t need these packets. I think they’ll probably sell, at least at first…but, not for me. 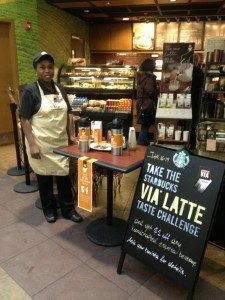 I choose to live a vegan lifestyle so I am unable to sample the new VIA Lattes, but as we conducted our VIA Latte Challenge our customers consistently preferred the VIA Latte Caffe Mocha over the handcrafted caffe mocha. Our customers preferred the handcrafted vanilla latte over the VIA Latte Vanilla Latte. 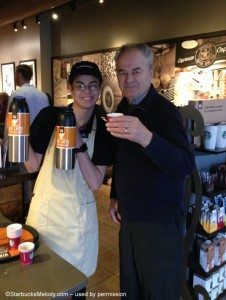 I would love to hear from other partners around the country what kind of feedback they received from their customers. 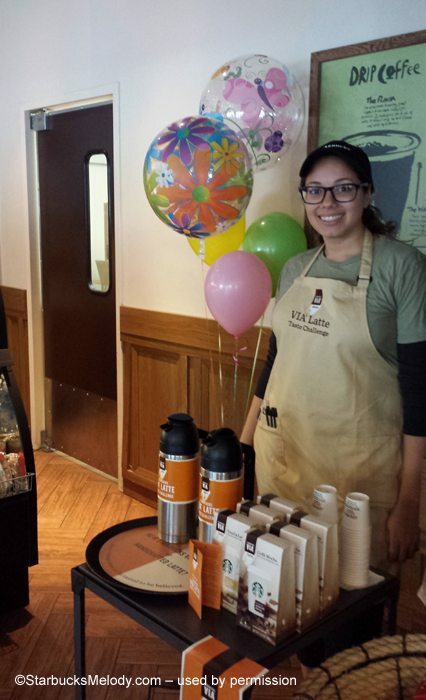 Here is Southern California we are in the midst of a heatwave with daytime temps hitting high 80s and low 90s so we actually offered the new VIA Lattes iced as well. Our customers really enjoyed them iced. @Melody- What was your preference? 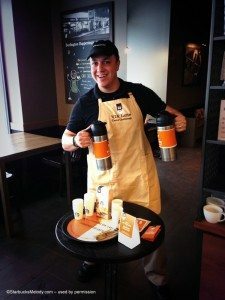 I love all these photos of smiling partners so ready to share this new product with their customers. Fun blog post! 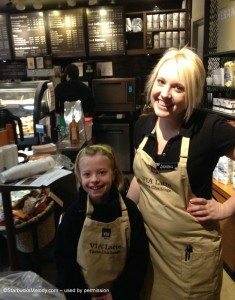 I missed the in-store challenge this past weekend, however the ever-cool manager at my local store allowed me to take a single packet of both the VIA mocha and vanilla latte to try at home. Unfortunately, I disliked them both. They tasted weak in strength and flat/dull in flavor. Oh! And the aftertaste? Blah! It’ll be interesting to see how these new products fare over time, but I’ll certainly stick with the handcrafted versions when I want a latte. I didn’t see a single tasting challenge happening. I saw all of the signs, and I even visited multiple stores, but with no luck. I had, however, bought a packet of each of the $1 samples. The vanilla latte one definitely doesn’t taste like a real vanilla latte, and it definitely had that slightly-off reconstituted taste, but for what it was, I didn’t think it was bad. I would certainly buy a box of them to keep at work in case of emergencies. The mocha, however. Yuck. Just yuck. I couldn’t even finish it. It reminded me somewhat of these instant mochas I used to make in my keurig, but not even as good. It doesn’t taste like coffee. It just tastes… well… my taste buds don’t approve. I was actually really surprised and disappointed. I could handle slightly-off (like the vanilla ones) for the sake of having instant just-add-water coffee goodness at work, but I wouldn’t even accept a free box of the mocha latte vias. Nolette Dumas is fantastic from Montvale, NJ.! No one single person has missed the Via Latte Taste Challenge! never saw this happening in-store; have now tried both flavors. um, -bleurgh- won’t be getting these again.